Chimu Inka’s New Band Member? 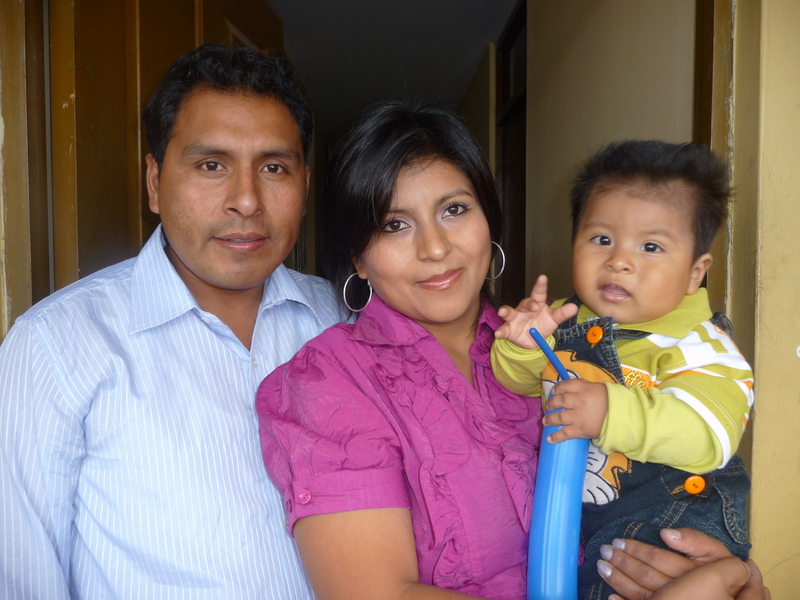 Guillermo Seminario, leader of the Peruvian band, Chimu Inka, with is wife Lourdes and their new son, born in Trujillo, Peru about 8 months ago. They just sent us this shot, which we wanted to share with you. Congrats to Familia Seminario. Chimu Inka has come to the U.S. under sponsorship from MSI in the past and will be visiting again in 2012. During their last tour in the U.S., Chimu Inka had some time to check out New England, kick their feet up and have some fun. Here are some images of light moments during their stay with us in Sunapee, NH. We stopped at a novelty shop in Portsmouth, NH. Guillermo Seminario had time to try on some of of the various headpieces that the U.S. has to offer. Wachi Taype also saw some sunglasses that seemed to fit him quite well. At least that’s what we thought. I assured him it had, and with providence, it will happen again! We can’t wait to have these bright souls back in the U.S.A., and of course for a tour to New Zealand when we’re there. Three Guys from the Andes putting up a Tipi in New Hampshire? It’s not every day you see three Peruvians at a New Hampshire State Park setting up a tipi. But this is what happened at Mountain Spirit Institute’s SunFest, a holistic health and sustainability event held at Mount Sunapee last year. Band leaders Guillermo Seminario, Wachi Taype and Mario Montalvo had just arrived from Peru the week before, for their first visit to the U.S. The three were in the U.S under invitation from Mountain Spirit Institute to teach and perform Andean folklore music throughout Vermont and New Hampshire. I decided to press them into action to help me erect our tipi for the SunFest. The tipi would be used for classroom space and presentations by vendors and speakers invited to come to the SunFest. I took the opportunity to get some shots of Guillermo, Wachi and Mario as they happily worked on putting up the tipi poles, fabric and the lacing pins. I kept asking them if they didn’t mind helping out, and they kept saying they were glad to learn about tipis. “It’s not something we ever thought we’d be doing,” said band director Guillermo Seminario, of Trujillo and Cusco, Peru. The group ended up playing Peruvian music at the SunFest as well as at other venues throughout New Hampshire and Vermont. While their tour was successful, (and they helped take the Tipi down after the SunFest), this turned out being their most unusual project during their stay, aside from playing in a few offbeat bars. Mountain Spirit Institute will be attending Burlington Vermont’s International Festival on December 4th-6th. MSI will have a booth explaining the mission and programs of the organization. 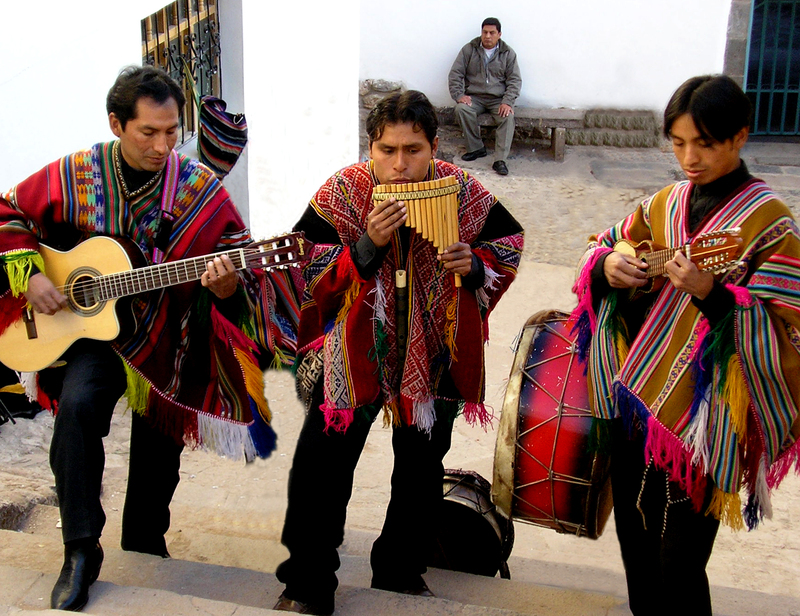 In particular, the Peruvian/USA Music Exchange with the Cusco band Chimu Inka, that was so popular in 2008 will be featured at the booth. Also our Peru and New Zealand programs will be presented, where visitors will have a chance to find out more about going on an MSI program in those countries or here in the U.S. MSI will also have Peruvian Fair Trade products and Chimu Inka CD’s and instruments for sale to help raise funds for their return, and to fund other MSI programs as well. The Festival has been running for over fifteen years, and according to Amanda Richards, the organizers of the event are excited to have Mountain Spirit attend the festival. We look forward to being there as well! Chimu Inka bandmember Wachi Taype recently celebrated his 30th birthday here in Cusco. Wachi visited the USA with Guillermo Seminario and Mario Montalvo to teach and perform traditional folklore music for universities, high schools and communities. He experienced a novel birthday when the candles wouldn’t go out o his cake. Onlookers are Guillermo, Mario, Mario’s daughter Auerlie, Amanda Richards and Wachi’s mother. The Andean Folklore music band from Cusco Peru, Chimu Inka, headed by Guillermo Seminario and joined by Wachi Taype and Mario Montalvo visited the USA in September and October of 2008. Their tour was a success beyond measure. They touched our New England communities with their grace, professionalism, humor and warmth. The group’s schedule was packed from beginning to end, and venues were calling asking for them to play at the last moment. Unfortunately we were only limited by the number of days in a week, and our energy. MSI Director Randy Richards hosted the trio at his home in Sunapee, and although they based out of Sunapee, aside from the engagements there, they didn’t spend a lot of time in town. The group covered Bennington and Montpelier Vermont to Gorham NH and Sturbridge Mass. They played universities, schools, coffeehouses and even one bar. According to Director Randy Richards, it was “mission acccomplished” at the end of the tour. “We definitely connected people to each other through this music exchange, and to themselves through the power of the music and the performances,” said Richards. MSI is excited to be working further with Guillermo Seminario and Chimu Inka this summer. For anyone interested in joining us, a small group, (limited to 6-7) will be going to Cusco, Machu Picchu and Lake Titicaca with Guillermo and Chimu Inka as our hosts. MSI has been running programs to Peru since 1998, (R Richards had been mountain guiding before that in Peru), and we are excited to be working with who we consider our dear family members Guillermo, Wachi and and Mario. We will visit with locals, do a small service project, stay in the Sacred Valley, venture to Machu Picchu and Lake Titicaca. There will be a base for a few days in Ollantaytambo where we will head to Willoc to study weaving in action. This area is known for it’s traditional weaves with mainly vegetable dyes. 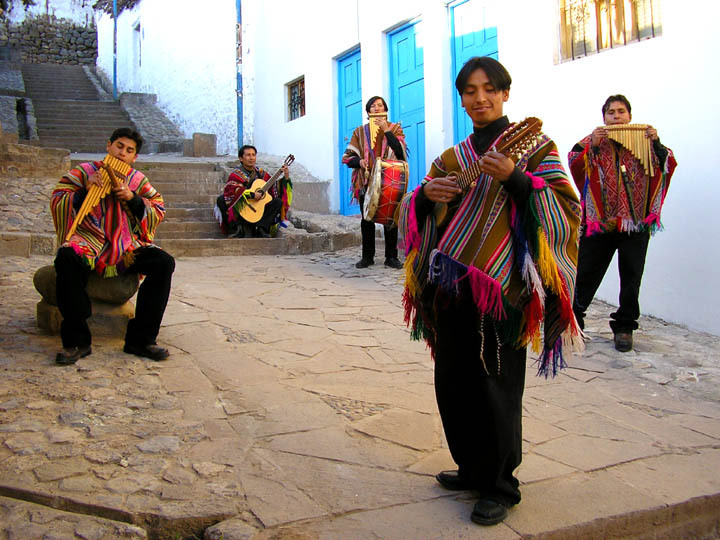 Of course, Guillermo and his band members will provide a strong musical influence, not only by performing, but sharing with us their history and love of traditional Andean folklore music. There is still space available, airline prices are at an all time low to Lima and Cusco, so we hope you’ll consider joining us. For more information see MSI’s website at www.mtnspirit.org or contact Randy Richards at 603-763-2668 or by email at randy@mtnspirit.org .